She Didn’t Pick the Resistance. The Resistance Picked Her. Now She’s One of Trump’s Most Fearless Opponents. Pramila Jayapal is defending immigrants and fighting the Muslim ban. There were signs of life earlier, fits of obstruction, but the moment when the Democratic Party officially awoke from its stupor and caught up to the reality of President Donald Trump came in the last weekend of January, at Seattle-Tacoma International Airport and a half-dozen places like it. On January 27, Trump had signed an executive order halting travel from seven predominantly Muslim countries. 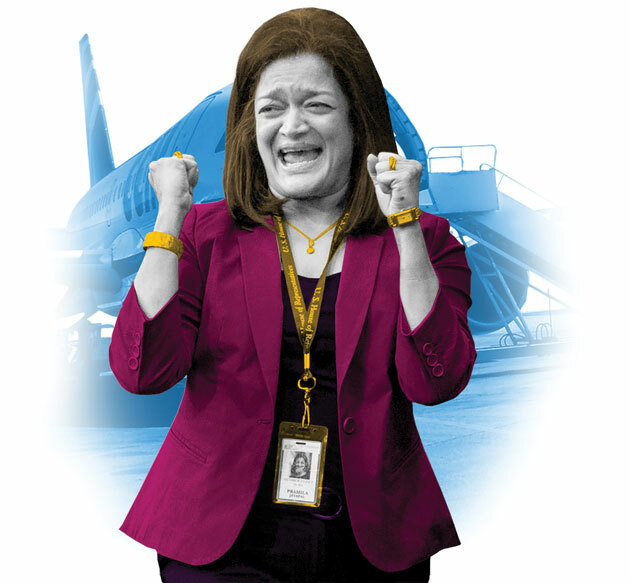 The next morning, following an example set by a few colleagues in New York, Rep. Pramila Jayapal, a member of Congress for all of 25 days, drove to Sea-Tac in the hopes of staging an intervention. One Somali man had already been put on a flight back to Europe before she arrived, but she feared that more deportations might be imminent. There was a problem, though—Jayapal had no idea who or how many people were being detained, because Customs and Border Protection officials were refusing to come out and speak with her. So after hours of haggling and waiting to no avail, Jayapal and a few allies, including fellow Rep. Suzan DelBene, piled into a Port of Seattle bus that snaked around the airport to the baggage handling area. They walked across the tarmac to the CBP office and banged on the door. When it finally opened, they told the CBP agents they had the governor on the line and needed answers. That got them the information they needed—the names of passengers set to be deported—and their intervention bought time for the courts, where lawyers had filed a challenge to the executive order. Late that night, with two would-be deportees already aboard a plane waiting to depart, a federal judge in Seattle, Thomas Zilly, issued a temporary restraining order halting the deportations. When the ordeal was over, Jayapal grabbed a megaphone to address a crowd of about 3,000 protesters inside the terminal. Jayapal’s intervention was a stopgap fix—a few weeks later Trump would unveil a modified travel ban, parts of which the Supreme Court allowed to go into effect on Monday—but a jolt of life nonetheless for a party struggling with its new role as the opposition. That weekend of spontaneous demonstrations and showdowns with Homeland Security officials has taken on an almost sacred significance as the moment when Democrats stopped playing nice and started getting real. When we met at her Capitol Hill office earlier this year, Jayapal had been in Congress for a little more than a month. The space was spartan, mostly empty save for a signed Washington Huskies football helmet and a few family photos. Inspired by the travel ban, she had introduced her first bill the previous day; it would mandate that anyone detained upon entry to the United States receive access to legal counsel. Jayapal, an early supporter of Vermont Sen. Bernie Sanders during last year’s Democratic primary, is at the vanguard of a leftward lurch within the Democratic caucus, one that opposes collaboration with Trump or Republicans at all costs. But she is also poised to take on a high profile because the biggest policy fights of the Trump era are playing out on her turf. In DC, she’s found herself reliving the immigration battles she waged for more than a decade as an organizer in Washington state, where she worked the courts and the grassroots to block the expulsion of Muslim immigrants and later was jailed for protesting President Barack Obama’s deportations. Jayapal is a congresswoman for the Trump era, calling for an inside-­outside game of direct action and obstruction. Jayapal’s politics were shaped by her unconventional path to Congress. In a legislative body that has put issues of immigration front and center, she is one of just 10 representatives who emigrated here from abroad. Born in India and raised in Indonesia, Jayapal moved to the United States at the age of 16 for her freshman year at Georgetown University. She graduated to business school and then a Wall Street investment bank but left after about two years to work on international development projects. In 1995, she won a fellowship to live and write in India. The ordeal also thrust her into the messy world of American immigration policy. Her extended stay on the subcontinent put her at risk of losing her status as a legal permanent resident, and even her insistence that a premature birth constituted extenuating medical circumstances failed to sway the US Immigration and Naturalization Service. When Jayapal finally was allowed to return to Seattle in 1997, she resolved to become an American citizen. Increasingly her work focused on immigrants, and she served on the board of a nonprofit fighting domestic violence in Seattle’s South Asian community. In the days after 9/11, her phone wouldn’t stop ringing. Muslim women called to complain that their hijabs had been yanked off in public or that rocks had been thrown at them. Jayapal became afraid to wear the wrong clothes, or to let her son leave the house. Hate Free Zone grew steadily in stature during the Bush years, eventually changing its name to OneAmerica and branching out to work on broader issues concerning immigrants. Jayapal was elected to the state Senate in 2014, and when longtime Democratic Rep. Jim McDermott announced his retirement, she jumped into a crowded field. She ran hard to the left, arguing against the Trans-Pacific Partnership and in support of single-payer health care. In a district and a state where Sanders won his caucus in a landslide, she easily bested a field of Democratic challengers. Now that Jayapal’s in DC, she’s found herself tackling much of the same agenda. She was an early co-sponsor of Michigan Democratic Rep. John Conyers’ Medicare for All Act. In April she and Sanders introduced twin bills to provide free college tuition. If her party is still coming to grips with its own shortcomings, she sees signs her colleagues have become a lot more aggressive. Back when she was an activist in Seattle, Jayapal was struck by the loneliness of the fight. Party leaders weren’t rushing to airports to block Bush- and Obama-era deportations. Only one Democratic senator opposed the Patriot Act; only one Democratic representative opposed the war on terror. Jayapal and millions of others marched against the Iraq War, but Democratic politicians rubber-stamped it. The DNC Chair Race Is Over. Now Comes the Real Battle.